After spending two weeks in Eastern Washington, Skyline was chomping at the bit to play at their new facility. 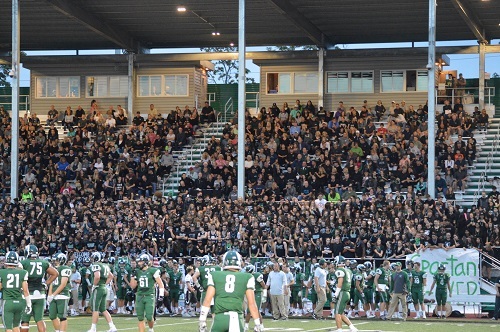 The 2015 runner-up Spartans hosted the 2-0 Eastlake Wolves in their season home opener for a pivotal 4A KingCo clash. Sparty took the opening drive the distance ending with a 2-yard punch-in by Isaiah Shim. Unfazed, Eastlake responded by marching down the field and quarterback Ben Howard connected with a diving Parker Lester in the back corner of the endzone. Skyline’s attacked found its groove by feeding their tailbacks the football behind their bruising left guard Henry Bainivalu. Riley Gill broke the deadlock on an 18 yard scamper up the gut to put the Spartans back up by a score heading into halftime. Eastlake emerged from the locker room with a will to even the score and did so when Howard found Hank Pladson for 62 yards and the game tying touchdown. A successful two-point conversion brought the score to 14 apiece. The Spartans bounced back when Kevin McGrane knocked in a field goal from 35 yards out. At 17-14, could the Wolves bounce back again? A clean sheet by Sparty’s defense allowed the McGrane kick to be the game-winner as Eastlake’s attempt to win was thwarted. Both teams will enter week four with identical 2-1 records. In the primetime matchup in the 4A KingCo Tournament, the Garfield Bulldogs faced off against the Eastlake Wolves for a spot in the KingCo Final and an automatic trip to the state tournament. In their only other matchup this season, Garfield put together a dominating 23 point win. This game, due to its magnitude, proved to be much closer to that. Eastlake was not going to let their previous defeat let them down, as they came out fighting in this contest. If it wasn’t for a couple of missed layups in the first quarter, the Wolves would have trailed by just one. But those misses hurt, and Garfield took a five point lead into the second. The second quarter stayed fairly close as Garfield held a double digit lead for less than one minute midway through the frame. With just five seconds left in the quarter, Tramaine Isabell, senior guard for the Bulldogs, pulled up from about 30 feet and knocked down a three pointer to push the Bulldog halftime lead to nine. Garfield continued to control the pace in the third quarter, extending their halftime lead to as many as 17. As the seconds winded down in the third, Garfield continued to put pressure on the Wolves, and took a secure 13 point lead into the fourth. The Bulldogs were in a groove throughout this contest. Every time the Wolves made a run, Garfield was right there to answer with either a spectacular drive to the basket or ferocious offensive rebounding leading to a put back bucket. This continued in the fourth quarter, as the Bulldogs bulldogged their way into the lane and capitalizing off their own misses. Eastlake won the fourth quarter but it wasn’t enough to take the game, as the Bulldogs advanced to play Issaquah in the KingCo final, where both teams qualify for state. Eastlake will have to win three straight games to qualify for state, with the last contest coming against the third seed from the Wesco district in a winner in, loser out game. Two of the top 4A girls teams in #8 Eastlake (10-2 league, 14-3 overall) and Woodinville (9-3, 11-6) met up Friday night for a pivotal battle in the KingCo Crest division. The Lady Wolves are led by post Marijke Vanderschaaf and her 14.3 points per game and superior rebounding ability. Woodinville boasts a lineup full of scoring options including Emily Spencer, Mackenzie Campbell, and Gabby Phillips. The importance of this league matchup was reflected in the attendance as there was a strong turnout for the clash of first and third place in the standings. The first half opened at an up-tempo pace as both teams were aggressive on getting to the bucket. Vanderschaaf quickly established her rebounding presence as the 6’3 post plucked the ball from air time and time again. Woodinville grabbed a 15-12 lead in the first quarter highlighted by a steal at midcourt by Sabin Keo and a nice dish to Campbell for the score. The Wolves used their length advantage early in the second frame by feeding Ellie Woerner and Vanderschaaf in the paint for high percentage shots. EHS was in the bonus early which yielded several trips to the charity stripe. However, Woodinville’s will to control the pace of the game was felt as the quarter progressed. Falcon senior Erin Hamilton knocked down some tough shots in the lane. Additionally, the defensive awareness of WHS was demonstrated several times as the Falcons took a handful of charges to gain possession. At the half, the home team led 33-24. Eastlake’s deficit continued to grow into the second half as a 5-0 run to start the third forced the Wolves to call a timeout and regroup down 38-24. Woodinville was simply clicking on this night as four players scored in double figures and their ability to score down low and from three point range kept EHS on the ropes all night. The Wolves were resilient though and made a strong effort to climb back in the game. The Woodinville lead was cut to single digits at the 2:30 mark in the fourth as EHS opted to foul throughout the quarter to protect the clock. Vanderschaaf made 5 buckets in the final eight minutes, but Woodinville refused to let their led dip below seven points. The Falcons cruised to a solid victory in which they scored 81 points over the first place team in KingCo in front of their home crowd. The Wolves notched 69 points in the contest. Do not be surprised if these two teams meet up again this season. A chilly November afternoon in the Sammamish plateau served as the site for a 4A quarterfinal matchup between the number one ranked Papermakers against host Eastlake. 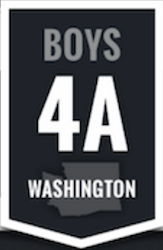 The winner was set to host a semifinal matchup with Bellarmine Prep next week who topped Bothell. The visitor sideline was too small for the large Camas crowd as many Papermaker fans watched from the fence. If Eastlake was going to pull an upset, they would have to get off to a strong start and set the tone. The Wolves caught Camas flat-footed early as the first play from scrimmage was a 70-yard touchdown run by UW commit Drew Lewis. Camas didn’t reach 10-0 and score at least 44 points every game this season for no reason as they responded quickly with a Zach Eagle run for six. Before the first half concluded, Eagle added a receiving score and fumble recovery for touchdown as part of his four on the contest. Lewis was a workhorse for Eastlake by scoring 3 rushing TDs on countless carries, using his 6’3” 205 frame to pick apart the stout front seven of CHS. At the break, Camas led 27-14. EHS was going to have to open up the playbook to find a way to dig themselves out of a hole in the second half to propose a chance to make a comeback. They successfully recovered an onside kick to start the half but were unable to capitalize. Joe Longcore came up with a Thomas Richard strike in the end zone in addition to Lewis’ third score to pull the Wolves within one score. The Camas defensive line stopped Eastlake on multiple fourth downs late and were able to turn the stops into points. The Papermakers ability to close strong was rewarded with a 47-28 victory. They will make a trip north to Tacoma to face the Lions next week. The two blackouts on the evening at Eastlake High School didn’t phase the home side from narrowly holding onto their victory over the visiting Union Titans. The first blackout came just minutes before kickoff, and the second with just over four minutes remaining in the game, with Eastlake barely clutching a seven point lead. Amazingly, the visiting Titans who travelled all the way from Vancouver, Washington, had a great support base and cheer section. The intensity was high for the entire contest, and the game itself did not disappoint. Eastlake scored first on a 35 yard run from junior running back Justin McOmber and Union responded immediately with a 47 yard pass from quarterback Nolan Henry to Alex Berfanger. The Wolves would add another score at the end of the first on Drew Lewis’ first of two touchdowns on the day. Union came storming back in the second quarter with another touchdown pass from Henry, this time to Tyler Dionne, and a touchdown run from Leon Siofele to take their first and only lead of the game. The Wolves responded with a Richard ‘Blue’ Thomas run that resulted in a fumble but was picked up by fellow Wolf Gage Casal for a score. Shockingly enough, this happened in the fourth quarter as well, where Union fumbled, recovered their own fumble, and scampered for a score. This score for the Titans tied the game at 27. Just three minutes later, Eastlake put together a fine drive that resulted in the last score of the game, a 1 yard touchdown run by Thomas. Eastlake narrowly escaped defeat, but held on 34-27 after a late interception and fumble recovery on defense. The Wolves will play Camas next weekend in the 4A state quarterfinals. Pop Keeney Stadium served as the site for a 4A KingCo Crest showdown between the Inglemoor Vikings and Eastlake Wolves. This was a very important game for each team which has work to do to maintain postseason aspirations. The Viks drew first blood on a 33 yard field goal by Mitchell Barker. He also netted kicks from 23, 27, and 28 yards. Eastlake found the end zone on a Troy Lewis run in the first frame. The Wolves took a 14-3 lead on a pick six in late in the first half. The scoreboard read 14-6 at intermission. The visiting squad from Sammamish continued to score early in the second half as they added 14 points on a 16 yard pass to Mitchell Augenstein and a 49 yard strike to Jeffrey Feinglas. Eastlake’s success on offense stemmed from their ability to notch big gains on early downs from Lewis to set up manageable third downs to keep the chains moving. Inglemoor had trouble in the red zone, settling for field goals when they needed touchdowns. Viking receiver John Gardner made several spectacular catches in tight coverage. They finally got their score on a 3 yard run late into the fourth, but Lewis responded with a 36 yard scamper of his own to secure the victory. Eastlake controlled the tempo of the game from the start. However, penalties allowed the host Inglemoor squad to keep the game within two possessions until the final minute of the game.